Come celebrate our shared Love for Life! Our ninth annual silent auction and dinner this year will be in the Grand Ballroom at the Denver Athletic Club, 1325 Glenarm Place, Denver, CO 80204 from 5:30 pm to 10:30 pm. This event is historically our largest fundraiser of the year and we have lots of great items for people to bid on to help us raise much needed funds. We will have live music by The Acousticators and there will also be a photo booth to capture the spirit of the night (courtesy of Hound Dog Studios). Tickets are $75 per person and included in the ticket price is a three-course dinner, an open bar for the first two hours of the evening (cash only bar after 7:30 pm), and live music. There are several delicious menu option and dietary restrictions can be accommodated upon request when purchasing tickets. If you are interested in sponsoring a table please contact Morgan for details. Read more about the event. You or your business can sponsor a table for $1,000, which comes with promotional signage at the event and in our program, as well as eight complimentary tickets at a reserved table. After purchasing tickets, you will be directed to a page to specify your meal choice. If you are not redirected to the page, you may find it here. We're sorry but ticket sales are now closed for our 9th Annual Love for Life Fundraiser. Please contact morgan@lifeisbetterrescue.org if you have any questions. Life is Better Rescue will be at PetSmart #252 on Saturday and Sunday(5285 Wadsworth Bypass, Arvada, CO 80002) for the National Adoption Weekend from 10 am to 4 pm on Saturday and Sunday. Adopt a pet and receive a FREE bag of Purina Pro Plan brand pet food for your new dog or cat. Plus other valuable coupons. Join Life is Better Rescue in the Relay for Rescue. Registration is $35 and includes a shirt in our team's color, a donation to LIBR, two Tito's drink tickets to use at any of the participating and two raffle tickets. Don't worry, there is NO ACTUAL RUNNING involved! The grand prize goes to the team that finishes first, there are tasks between each bar and a scavenger hunt at each bar to keep it from moving too fast. Other prizes will be for the team with the most number of registrations. 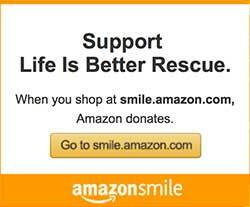 Please note on your first visit to AmazonSmile, you need to select a charitable organization to receive donations from eligible purchases before you begin shopping. Life is Better Rescue is partnering with BarkBox to bring you savings and your pups joy. Get $5 off any BarkBox subscription and support our rescue! For every coupon used on BarkBox.com, our rescue will get a $15 donation from BarkBox. Be sure to use our special promo code: LifBBX1. Find a low-cost spay/neuter program near you.